Following the path of our blog series on the “Evolution of Foodways” we now move on to the later Woodland periods. However, before we discuss the kinds of plant foods that were used by indigenous groups of this period let’s take a look at how the environment changed human adaptation after the Transitional Period and feature some of the hallmark artifacts of the time. Around 2000 years ago the climate of Pennsylvania was generally cool and moist and the forests were dominated by dense growths of Quercus spp. (Oak), Tsuga spp. (Hemlock) and Castanea spp. (Chestnut) that supported a plethora of birds and animals. Valley bottoms grew in size because of the amplified alluviation of the floodplains that, often, flooded their banks thereby enriching the soils for plant growth. By about 1500 years ago there appears to have been a trend to a slightly warmer yet moist climate that continued to support the healthy growth of hardwoods and great hemlocks . The valleys began to stabilize with fewer seasonal floodings occurring. At the beginning of the Late Woodland period around 900-1000 AD., the climate returned to cooler and drier conditions giving rise to conifer growth, namely Picea spp. (spruce) and Pinus spp. (pine) with a return to more frequent flooding of the river valleys. A dramatic change occurred around 1300-1350 AD., with the onset of the Neo-Boreal or what climatologists called the“Little Ice Age” when conditions for crop failures rose dramatically throughout the world. This was in complete contrast from the earlier Medieval Maximum period at the Middle to Late Woodland period transition when crops and the climate were much kinder to humans and their environment. The “Little Ice Age” lasted well into the Historic Period - ending around 1850 AD. when the United States was rapidly expanding westward. Each succeeding cultural period had its definitive stone point style. 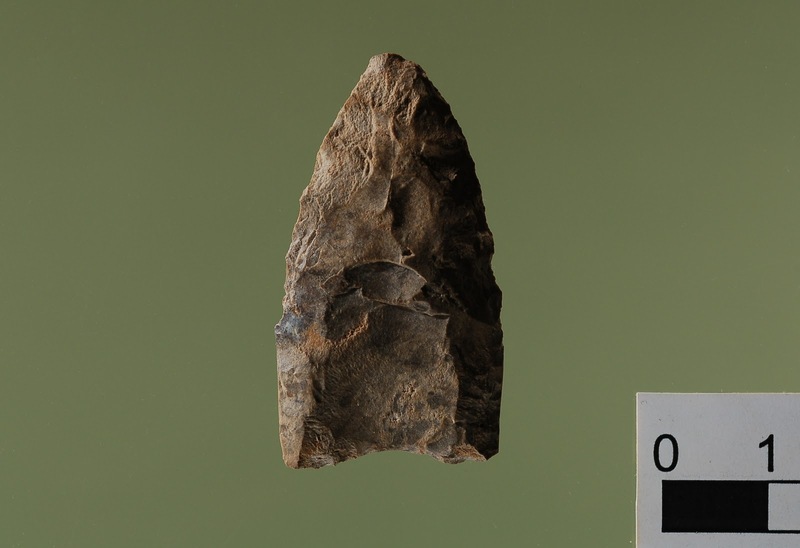 The trend seems to have been from fluted points in the Paleoindian period to atlatl spear points and knives in the Archaic /Transitional/ and Early Woodland periods to generally smaller Middle Woodland and Late Woodland forms. It was during the Middle to Late Woodland transition circa. 700/850-900 AD. when the bow and arrow seems to arrive on the scene. Indeed, this was a technological break in the cultural record that was hallmarked by small corner notched and triangular-shaped points. Now, on with the foods. Many nut species are present at archaeological sites of this general period. Common were Carya spp. (hickory), Juglans spp. (butternut), Castanea spp. (chestnut) and a host of other species. Although starchy foods such as arrowroot and wild artichoke tubers would have been available for human consumption along with a host of other fleshy foods the archaeological evidence is rare. Strides being made through the analysis of starch grains may well be the tool that unlocks many of the hidden secrets associated with certain prehistoric plant use. Beginning with the Middle Woodland period and extending into the Late Woodland/Late Prehistoric period, Pennsylvania’s indigenous Indian populations were propagating some native plant foods of the Eastern Agricultural Complex. 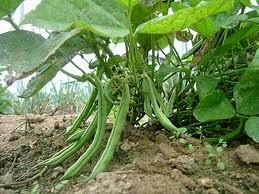 Although there are no direct correlations with radiocarbon dates for the Middle Woodland the plant foods of the period include Cucurbita pepo (squash/gourd); Chenopodium spp. (goosefoot); Polygonum spp. (knotweed or smartweed); Hordeum pusillum (little barley); Phalaris caroliniana (maygrass); Iva annua (sumpweed). Most of these plant foods are well represented at archaeological sites of the following Late Woodland/Late prehistoric period with the inclusion of Helianthus annuus (sunflower). Many of the plants that Native Americans cultivated as a source for food arrived in northeast North America from Mexico long ago. The paleobotanical record shows that these foods began to spread far back in time and the vast Mississippi River valley that drains much of the central plains region of the United States was the principal route by which people and their ideas spread into the remote interior of North America. About two thousand years ago, beginning with the Early/Middle Woodland period transition several of these plant foods became extremely important to prehistoric Native Americans living in the Mississippi Valley and its wide spread tributary regions. 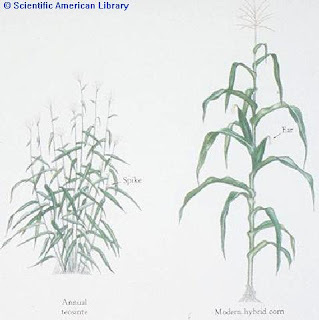 Corn’s ancestor, teosinte, a plant of the grass family having hard triangular-shaped kernels, whose origin was Central America has around a 9,000 years old history! Through plant husbandry and selective growing , one of its descendents, Zea mays (corn) evolved from a number of popcorn varieties. Following these were the “southern dents” and the “northern flints”, the varieties that essentially comprise the corns that are grown and consumed today. Although the antiquity of beans in the Eastern Hemisphere has the equivalent antiquity of corn in the Western Hemisphere, cultivated beans (Phaseolus) apparently did not appear until much later in our part of the world. As the evidence is now viewed, the earliest beans were recovered from the buried dusty soil deposits of a dry Peruvian site called Guitarrero Cave. Beans from that site are about 4000 years old. Beginning with the 1960’s investigations of archaeological sites, an archaeological recovery technique called flotation was developed that broadened our knowledge regarding plant foods and their implications for use among prehistoric societies. As previous TWIPA blogs have shown, many prehistoric sites where this method of archaeological recovery was employed, reveals a diverse assemblage of plant utilization from Paleoindian to the Late Woodland periods. Throughout the Upper Ohio Valley, Susquehanna Valley and the Delaware Valley corn and beans were without question the principal plant crops grown and eaten by prehistoric groups. As well, some of the plant byproducts from corn made useful objects such as sandals, mats, salt bottles, ceremonial masks, etc. Many of these unique items have survived the ages for us to see in museums throughout the world. The earliest corn in Pennsylvania is dated to 2300 years ago. It is a small 16 row popcorn cob from Meadowcroft Rockshelter located in the Cross Creek drainage of the Upper Ohio Valley. Corn from later occupations within the rockshelter contained 10, 12 and 14 row cobs thereby stratigraphically demonstrating their younger age. Corn recovered from the Sheep Rock Shelter, a site flooded by the Raystown Reservoir has not been radiocarbon dated so its antiquity cannot be ascertained at this time. Dated corn specimens reported from Pennsylvania, bracket the terminal Middle to Late Woodland transition and later Late Prehistoric periods. The earliest corn dates are around AD 950, and are associated with the Clemson Island/Owasco occupations of the Susquehanna Valley. Strontium analysis of bone from this period clearly show that the consumption of corn exceeded 50% of the indigenous diet at this time. By the 13th century when village life became more settled the dominant variety is the 12 row Flint corn. The common bean Phaseolus vulgaris does not arrive in Pennsylvania until sometime in the 13th century where carbonized specimens show up in archaeological site contexts of the Susquehanna Valley. By then, village life became more structured with planned fortified settlements being the norm. One must remember that the introduction and propagation of crops such as corn and beans, supported larger populations. This situation reduced the size of buffer zones between competing social groups (ie. hunting and fishing territories, firewood and new land to replace old fields depleted of nutrients). This was probably at least part of the explanation for increased warfare during the Late Woodland period. By comparison, the Delaware valley seems to have experienced a different set of circumstances in terms of the paleobotanical subsistence record and site usage during these later periods of prehistory. Planned villages appear to be non-existent! Although corn and beans occur in good archaeological contexts at these sites their contexts suggest seasonal usage at floodplain locations adjacent to fishing grounds. Few structural remains such as houses and no palisades have been found that typify some level of permanency as regards to land usage during the later Woodland periods. Sites normally show a predilection for short term use by virtue of trash filled pits containing much of the assemblage normally representative of site use. Yet the carbonized corn and bean remains that suggest agricultural use are present in the refilled trash pits. Whatever the case, we do know that the people living the Delaware Valley at this time were consuming corn and beans as well as many wild plant foods. The Transitional period is characterized by the use of multifunctional broadspear and fishtail biface types, steatite bowls, the earliest ceramic pottery, enormous fire-cracked-rock (FCR) features and the trade of jasper and metarhyolite over large regions. The beginning of this period corresponds with the warm and dry Sub-Boreal climatic episode. These conditions were different from the warm and wet Late Archaic period and led to periodic food shortages. The climate of the Transitional period ended with a return of generally warm and wet conditions (the Sub-Atlantic climatic episode) that encouraged the spread of chestnut trees in the Pennsylvania forest. Based on artifacts, site locations and preserved food remains, people of the Transitional period ate the same variety of foods that were consumed during Archaic times. Deer, elk, a variety of small mammals, fish, shell fish, birds, hickory nuts, walnuts, acorns and a variety of seeds, roots and berries were all being used; seemingly everything edible in the forest was being exploited. However, there were two major differences from the Late Archaic period. During the Transitional period, food was cooked or processed differently than previous times. There were two significant changes. The major innovation and a hallmark of this period was the use of carved stone bowls made from steatite or soapstone. These appeared approximately 3900 years ago. Steatite bowls were found in a variety of sizes, holding from less than a pint to several gallons. Some exhibit evidence of heating in the form of smoke stains on the outside and some do not seem to have been used for cooking. Their function has been debated but the largest bowls clearly represent cooking containers. They were the first portable cooking containers to appear in the archaeological record. Baskets lined with animal hide may have been used during earlier times but these are also rarely preserved in the archaeological record. The ability to boil foods had several nutritional advantages such as retaining calories and removing toxins. Generally, the use of steatite bowls in cooking represented an increase in the efficiency of processing foods that was a necessary response to periodic food shortages. A second change in the way foods were processed is indicated by the increase in the frequency of fire-cracked-rock (FCR) features (the end result of heating stone in cooking fires – link to blog of April 15, 2011) in the archaeological record. Floodplain sites typically contain large quantities of FCR in the form of dense concentrations and/or large, diffused scatters. Late Archaic sites contain rock hearths but Transitional period sites contain more hearths and much larger quantities of FCR. During the Transitional period, FCR features are commonly over ten feet in diameter and six inches thick. Archaeologists have long thought that since these sites were usually along major rivers, these features represent large fish drying racks. 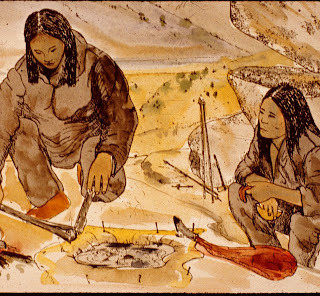 More recently, archaeologists have posited other explanations for FCR concentrations by experimenting with different cooking techniques and using a variety of foods. Based on this research, these features could have been used to dry or roast other meats, shellfish, or nuts. The considerable quantities of FCR seem to represent the processing of foods that were available in large quantities such as would have occurred during annual fish and waterfowl migrations or the seasonal harvesting of nuts and seeds. However, countering the roasting interpretation is the observation that FCR features rarely contain fishbone (or any other type of bone) and frequently, very little charcoal. An alternative to the roasting/drying hypothesis is that FCR resulted from a process called “stone boiling.” This method began by digging a hole in the ground the hole would that would be lined with animal hide in order to seal it, which is than filled with water. In a near-by fire, rocks would be heated and added to the water using tongs made from saplings the heated rocks would be added to the water. Within half an hour, a soup of hickory nuts, seeds, and fish could be brought to a boil. It is also possible that rather than digging a hole in the ground, native people simply lined a large basket with animal hide. Another method involved filling the pit with heated rock and green leaves to construct an earth oven for steaming. As with boiling, steaming preserves more calories over foods that are roasted on an open fire. The FCR produced from boiling/steaming appears as either dense clusters or piles of FCR as if it were dumped from a container or the FCR is scattered over large areas of the living floors. 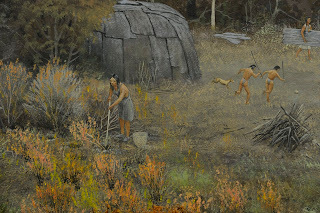 Image of native peoples boiling foods. These features represent a more efficient cooking method that resulted in more calories being extracted from these foods. 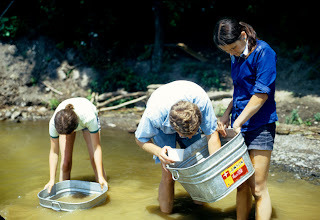 The use of steatite bowls for cooking and the widespread appearance of FCR features are an indication that Native American groups were intensifying their exploitation of the environment This technological change allowed for an increase in the carrying capacity of the environment to support native populations during times of periodic shortages. Steatitie bowls mark a significant change in food processing during the Transitional Period. The second major difference in subsistence patterns of the Transitional period is probably more significant and has come to light as the result of improved archaeological methods. The preservation of organic materials and the reconstruction of prehistoric diets has long been a problem for archaeologists because food remains are rarely preserved at archaeological sites. However, beginning in the late 1990s, archaeology experienced a transformation in collecting techniques called the “paleoethnobotanical revolution”. 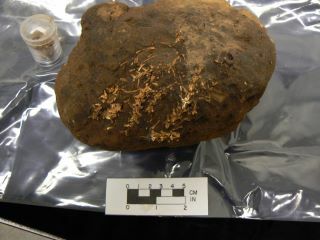 The regular use of flotation methods has resulted in the recovery of many small artifacts, especially food remains such as seeds and nut parts. In addition, improvements in scientific analysis have allowed archaeologists to now analyze the charred residue found on the inside of steatite bowls and pottery. They are even able to identify plant residues on grinding stones. Floatation is an essential tool in analyzing the diet of Native peoples. As in the Archaic, Transitional period people were using a diversity of foods as but they were processing them more efficiently. 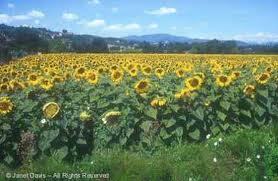 In addition, they seem to have intensified the use of seed plants and they were probably cultivating some plants. Indeed, maintaining a garden required more work than simply collecting wild seeds and nuts. In addition, some foods, such as acorns from red oaks (as compared to white oaks) contain more tannin that requires processing to remove the bitter tasting and acidic compounds. Transitional period people began the process of horticulture, thereby producing more food but at the same time were spending more hours at recovering calories from their environment. It is assumed by many archaeologists that the extra work was necessary to support larger populations. Finally, during the Transitional period there is extensive evidence for trade with other groups and there are indications that families were organized differently to more efficiently exploit a variety of resources. Band size continued to change based on seasonally available foods but the spring fishing camp or the fall hickory nut collecting camp likely contained ten to twelve families (over 50 men, women, and children). Clay pottery was introduced at the end of the Transitional period and suggests that families were becoming more sedentary. Near the end of this period, it is believed that native peoples were increasingly cultivating plants in small gardens that included squash, little barley, knotweed and lambs quarter. This was the beginning of farming in Pennsylvania and a more sedentary life that had a profound affect on family social organization (although the details are not known). The climate improves near the end of the Transitional period, broadspears and fishtail bifaces disappear, however ceramic pottery replaces steatite bowls over a period of several hundred years. The exploitation of domesticated plants continued into the Early and Middle Woodland times but whatever was being processed with FCR generally ceases. The need for this intensive processing is possibly offset by a focus on seed plants, some of which were cultivated. The cultivation of these plants was facilitated by the warm and wet conditions of the Sub-Atlantic climatic episode. See you at The Pennsylvania Farm Show January 7th-14th, 2012! 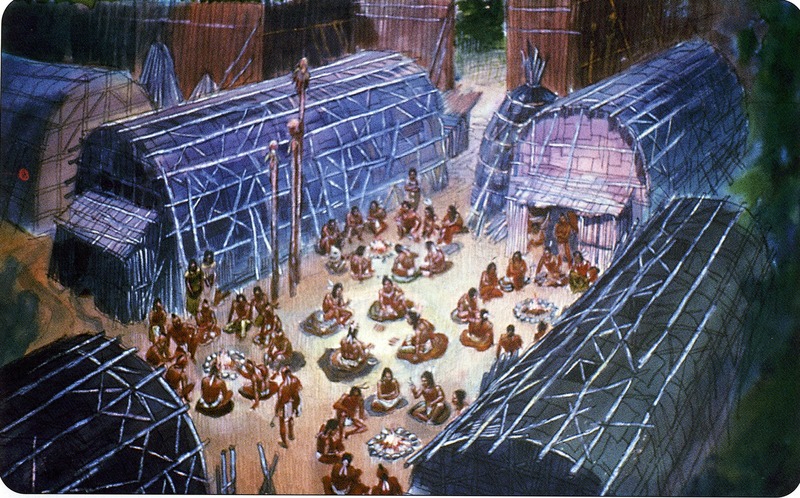 This week we will continue with our presentation on the evolution of “foodways” in Pennsylvania by describing subsistence patterns during the Archaic period. This period dates from 10,000 to4,300 years ago and is divided into the Early, Middle and Late stages. Climatically it begins at the end of the Ice Age and the onset of the modern climate or the Holocene epic. It is characterized by temperatures and precipitation that quickly rose to near modern conditions with the spruce parkland of the Ice Age being replaced by a spruce/pine forest. Deciduous trees, such as oak, were mainly found on terraces along the larger rivers and streams. Otherwise, the land that would become Pennsylvania was covered by a dense, coniferous forest. Food resources were limited and concentrated in river valleys, upland swamps and bogs. 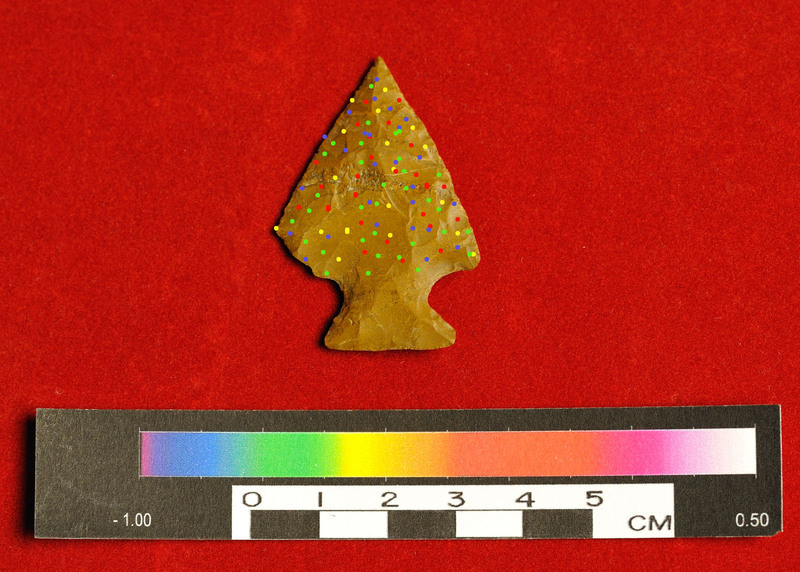 The major technological change defining the Early Archaic was found in the shape of spear points. Fluted and lanceolate shapes or forms changed to mainly corner-notched forms such as Kirk, Palmer and Charleston types. As is true for the Paleoindian period, very few food remains are preserved at Early Archaic sites and subsistence is inferred from tool types and the potential foods available in the Holocene environment. Population size did not significantly increase over Paleoindian times and bands consisted of less than five families (20 – 25 men, women and children). 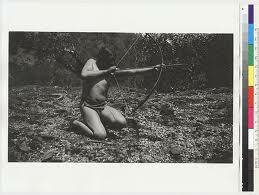 It is assumed that people of the Early Archaic period were generalized foragers i.e hunters and gatherers. In many ways the subsistence patterns of the Early Archaic were not much different than those of the Paleoindian period. Bands moved over large territories to the location of concentrated and easily collected foods. 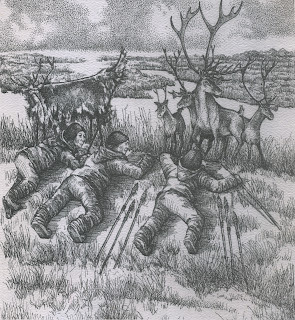 Native Americans no longer exploited migratory game as was probably done during earlier Clovis times but the hunting of elk, deer and small game was common. Hunting animals and fishing probably continued as the main source of food contributing 50% of the caloric intake of each person. The remainder of their diet consisted of seeds, nuts, roots and berries. However, there is little evidence that stone tools were used to prepare these foods although the processing aspect was probably accomplished with wood, bone or antler tools that are not normally preserved in the archaeological record of prehistoric Pennsylvania. By approximately 9,000 years ago, the beginning of the Middle Archaic period, broad leafed trees were filling the forests. A wide variety of nut bearing trees (walnut, hickory, butternut, oaks with acorns) seed producing grasses, edible roots and berries became available for consumption. Along with a greater variety of mammals (deer, beaver, bear, rabbit), birds (turkey, ducks) and fish (Atlantic sturgeon, shad, Atlantic salmon), there was a huge increase in the quantity of foods available to humans. 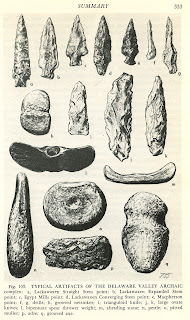 Tools to exploit the hardwood forest such as axes and adzes became common and the atlatl (spear thrower) was used in hunting. 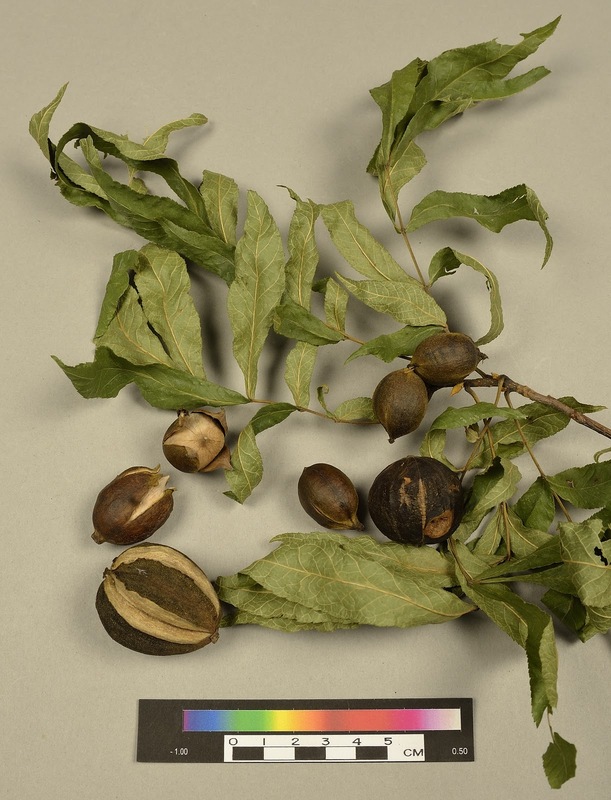 Although the available data base is limited, charred acorns and walnut shells began to appear in the archaeological record. Grinding stones for processing seeds and nuts begin to appear, as do and netweights for fishing. These tools suggest that plant foods and fishing were becoming more important and were being processed in larger numbers. Generally, it is simply easier to collect large quantities of seeds or nuts, than it is to kill and process a deer for example. In addition, plant foods usually preserve longer than animal foods. 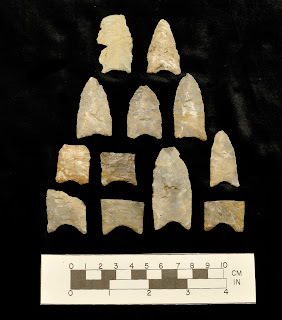 Based on the Pennsylvania Archaeological Site Survey files, there is a 150% increase in the number of sites from this time period compared to the Early Archaic and it is believed that this represents a significant increase in human populations. Bands continue to follow a regular seasonal pattern of movements but their territories become smaller than during the Early Archaic period. Band size does not seem to have increased but there appears to be many more bands in an overall larger population. However, food resources in this environment were so plentiful that there was little need to develop special tools to intensify their exploitation of the environment. The Late Archaic period is an intensification of trends developed during the Middle Archaic period. Human populations continue to increase in size and band size increased to six to eight families (25 – 35 men, women and children). Grinding stones and netweights become very common. Nets may also have been used to bring down nesting and migratory birds. By the Late Archaic, band size increased to the point where these foods needed to be more efficiently processed and in larger quantities to increase the caloric intake of the band. Large roasting hearths appear and seem to represent large scale food processing. These features are frequently found on floodplain sites and were initially thought to represent large fish drying platforms. However, more recent data suggests that they were used to process nuts or tubers (roots). As during previous times, the bands changed in size depending on the foods being exploited but they are now larger and seem to have occupied the sites for longer periods of time. During spring fish migrations and fall nut harvests, these groups may have grown to 50 or more people. In winter, they broke into smaller groups to harvest deer and small game in upland camps. Finally, by the end of the Late Archaic there is good evidence in the form of charred nut shells and preserved plant residues that show a greater variety of plant foods, especially seeds, were being exploited. In addition, there are indications that Native Americans began to focus more of their time collecting and growing seed plants. Squash, grown in small gardens were likely the first cultigens supplementing the Archaic diet. The Archaic period is an interesting time of population growth in a relatively bountiful environment. During the Early Archaic period, human populations remained small, the environment did not contain large amount of food resources and the types of tools were not much different than during Paleoindian times. Beginning in the Middle Archaic period, human populations had grown significantly but food resources also increased. There was little need to develop stone tools to maximize the processing of these foods because of their abundance. By Late Archaic times, human populations continued to increase and food processing tools such as grinding stones and net sinkers became common and necessary to support the large population. Throughout this time period, Native Americans practiced a regular pattern of seasonal movements to exploit food resources; the group moved to settings where food resources were concentrated and easily processed. There are no indicators of significant changes in social organization or trade. During this holiday season, many of us will eat too much but promise ourselves that we will diet as soon as the feasting is over. As if to acknowledge this schizophrenic behavior, the Pennsylvania Historical and Museum Commission has chosen Pennsylvania Foodways as its theme for 2012. The first major presentation of this theme will be at the Pennsylvania Farm Show from 1/7/12 – 1/14/12. The goal of the PHMC is to celebrate and commemorate the history of agriculture and the famous foods (the oldest brewery and the most snack foods) of the Commonwealth. In keeping with this theme, our blog until the end of the Farm Show, will cover the evolution of subsistence patterns in Pennsylvania or people’s diet over the past 16,000 years. We will begin with Native American subsistence patterns and end with subsistence patterns of the colonial period. This week, we begin with the Paleoindian period. The Paleoindian period dates between 16,000 and 10,000 years ago. It generally corresponds to the end of the Ice Age. The land that eventually became Pennsylvania was not the lush forest Native Americans enjoyed at the time of European contact. Instead it was an open spruce forest with only a few broad leafed trees such as oaks along the major streams and rivers. This environment did not contain nearly the food resources that were available to Native Americans during later time periods. A major problem with determining the Paleoindian diet is the very poor preservation of organic remains such as animal bones or plant parts in the eastern United States. Unless they are partially burned, these are hardly ever preserved in the archaeological record. Much of the early speculation on the diet of Paleoindians was based on archaeology conducted in the western United States. Based on archaeological sites excavated in the west that contained the remains of mammoth, mastodon and extinct bison, archaeologists believed for a long time that Paleoindians in Pennsylvania were highly mobile, big-game hunters. In Florida, there is a growing body of data indicating mammoth steaks were part of the Paleoindian subsistence pattern. It was assumed that Paleoindians also hunted a variety of smaller animals and ate a wide variety of plant foods, but a significant part of their diet was based on now extinct Ice Age animals. However, in the Northeast, there is no association of extinct animals with Paleoindian artifacts. In fact, the East (north of Florida) does not contain much data to address the issue of diet. Therefore, answering the question of what Paleoindians ate has been a major obstacle to understanding their adaptation. The Shoop site (36Da20) was one of the first Paleoindian sites reported in the East and it seemed to support the “big game hunting” hypothesis. This site is located in upper Dauphin County, nine miles east of the Susquehanna River. It is the largest Paleoindian site in Pennsylvania and one of the largest in the eastern United States. It was first analyzed by John Witthoft, in 1952, who was then Pennsylvania’s State Archaeologist. The site has produced over one thousand tools, including hundreds of scrapers (probably used to clean animal hides) and approximately ninety fluted spear points. The stone used to make 98% of these tools is Onondaga chert and its nearest source is western New York, 250 miles to the north. There are at least eleven concentrations of artifacts at the Shoop site. One theory is that each concentration represents a separate visit between western New York and central Pennsylvania. No food remains have been found, but it is hard to attribute the high numbers of spear points and possible hide scraping tools on a ridge top setting to anything other than hunting. Archaeologists have long speculated that this site was probably situated on a caribou or elk migration route and was visited on an annual basis to hunt these animals. 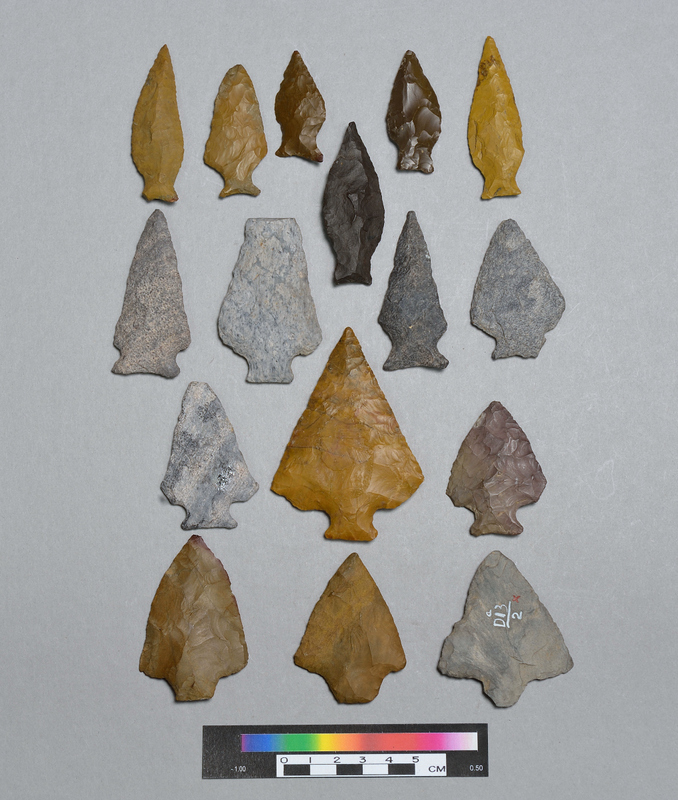 The majority of Paleoindian sites in Pennsylvania are small and only contain one or two fluted spear points and a few other stone tools. Food remains in the form of partially burned bone, nuts or seeds are hardly ever found. One of the few sites in the East to produce actual dietary remains is the Shawnee-Minisink (36Mr43) site in the Upper Delaware Valley. This site has changed the theory that portrayed the Paleoindians as the big-game hunters in the East. Shawnee-Minisink is one of the few deeply buried Paleoindian sites in the East. The site was discovered by Don Kline and first excavated by Dr. Charles McNett from American University. More recently, additional excavations have been completed under the direction of Joseph Gingerich of the University of Wyoming. The site contains many tools, including over one hundred scrapers but only two fluted points. Based on radiocarbon dating, the Paleoindian occupation dates to 10,950 years ago. Several cooking hearths yielded a variety of carbonized seeds including hawthorn plum, hickory, and fish bone. Unfortunately, the fish bone could not be identified to genus or species. The occupants of this site seem to be generalized foragers rather than big game hunters. Compared to the Shoop site, there is no evidence in the form of large numbers of stone spear points for extensive hunting at Shawnee-Minisink. Further, 95% of the stone for making tools was a locally quarried chert probably collected within two miles of the site. The remaining toolstone originated less than 100 miles from its source which suggests a territory much smaller than the Shoop site. These two sites present very different pictures of Paleoindian subsistence patterns and the Paleoindian lifestyle. However, when we begin to examine Paleoindian sites to the north in New England and Canada or to the south in Virginia and the Carolinas, a pattern begins to emerge. 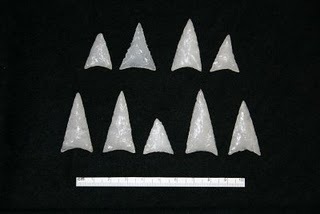 There are several sites in New England that are similar to Shoop with large numbers of spear points and hide scrapers made in stone that was transported hundreds of miles. At several of these sites fragments of burned caribou bone has been recovered verifying the exploitation of this animal. 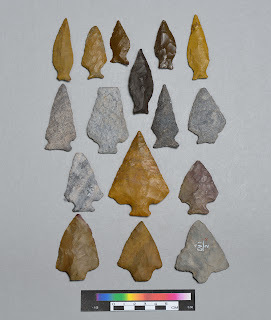 To the south, Paleoindian habitation sites are small, containing small numbers of finished spear points, a variety of tool types and these are frequently made in stone from sources less than 100 miles away. These two types of sites seem to represent different subsistence patterns; one exploiting a variety of plants, animals and fish and the other utilizing at least some of their time exploiting migratory game such as caribou, elk, or migratory birds. Pennsylvania is on the border of these two adaptations. During the Paleoindian period in both regions people moved their camps in a seasonal pattern or “round” to the locations of predictable food resources, such as along the migration routes of caribou, water fowl, or anadromous (spawning) fish. The seasonal round also included a number of plant-food collecting sites although we do not know much about these. Compared to later groups, their seasonal round was very large covering over 100 miles. In the northern part of the state there is evidence for the hunting of migratory caribou. In the southern part of state, general foraging in the form of gathering seeds, nuts, berries, roots and fishing was more common. Their subsistence strategy involved collecting the most concentrated foods and those that did not require any special processing. Their adaptation involved traveling long distances to more easily exploitable resources. The Ice Age was a harsh time, but human populations were very low and there was little competition among bands over the easily exploitable foods. Although, the overall quantity of food in this environment was low, the human population was also small permitting their choice of foods that were the easiest to collect. 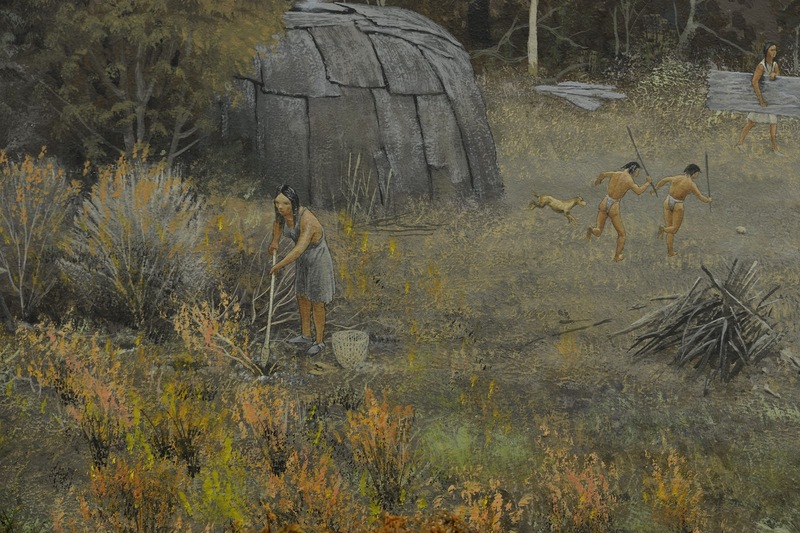 Although hunting probably dominated Paleoindian subsistence in Pennsylvania, they were not primarily big game hunters and approximately 40% of their diet was from seeds, nuts, berries and roots. This is in contrast to the Archaic period when plant foods dominated the diet. Welcome back! We trust all our readers have recovered from their tryptophan induced stupors of last week’s annual tribute to gastronomic excess. To burn off those extra helpings of stuffing we all enjoyed, some of the staff from The State Museum of PA's Section of Archaeology and the Bureau for Historic Preservation participated Monday in a field visit to an archaeological site along the Philadelphia waterfront, currently underway as part of a PennDoT project to improve a portion of Interstate 95. Down by the river (please excuse the Chris Farley reference) and a stone’s throw away from whizzing interstate traffic, a team of archaeologists from URS Corporation, lead by Doug Mooney, have uncovered the remains of an important part of our nation’s emerging industrial might of the 19th Century, the Dyottville Glass manufacturing complex along the Delaware River. “Dr. Thomas Dyott arrived in Philadelphia from England in the 1790s. Starting out as a manufacturer of patent medicines, he eventually acquired a glass factory near Kensington.” (Cotter, Roberts and Parrington pg. 451). While the glassworks would continue production throughout the 19th century, Dr. Dyotts involvement was comparatively short-lived. “The factory was closed down in 1839 when its proprietor was found guilty of fraudulent insolvency and jailed. It reopened under new management three years later.” (Cotter, Roberts and Parrington pg. 452). Not surprisingly due to its proximity to the Delaware River, prehistoric artifacts such as triangular projectile points and fragments of native-made pottery dating to the Late Woodland period were discovered at the site underneath the multiple layers of historic occupation. During the visit, it was noted that with a great deal of attention being focused on archaeological investigations that have taken place near Center City (in association with Independence Hall, the National Constitution Center, and President Washington’s house, etc. ), residents of the somewhat removed Kensington and Fishtown neighborhoods of the city have taken a measure of pride in a piece of their own heritage discovered just a few blocks from their doorsteps. Yo! Click here for an article that Hayden Mitman wrote for the Northeast Times about an artifact exhibit at the Kensington CAPA High School, and here for a more in-depth overview of Dyottville by Ian Charlton of the Historical Society of Pennsylvania for Philaplace.org. Thanks go to Doug Mooney, George Cress and Stephen Tull of URS Corp. and Cathy Spohn, PennDoT District 6 Archaeologist, for coordinating what proved to be an interesting and informative visit to an archaeological site in a dense urban-industrial setting on an unusually balmy late November afternoon. Labels: Dyottville, PennDoT, URS Corp.
With the theme of Thanksgiving in mind our thoughts this week turn to diets. Nothing to do with dieting, rather we’d like to look at what people have eaten for the past few thousands of years. Most people immediately think about deer, elk or bear for meat, some may think of corn or grains. The diet of native peoples was very diverse and complex and changed over time in conjunction with changes in the environment. You might wonder how archaeologists are able to recreate a picture of the foods consumed by native peoples thousands of years ago. Paleoethnobotany is the science which looks at the relationship between humans and plants. How humans impact the development of plants and the level of labor required to process these plants and seeds. What is preserved? How do we recover these remains of the past? With assistance this week from a guest blogger Roger Moeller, PhD, we will learn about the floatation process. The flotation process is very simple. The best flotation tub is a square, galvanized, handled, wash tub (12 gal Dovertm) with the bottom replaced by 1/16” hardware cloth. Standing in flowing water with the tub submerged to within 3" of the rim, slowly pour soil into the tub while agitating the tub in a circular pattern. When the all the fine-grained soil has passed through the screen, skim the floating materials with a tea strainer and place them onto a drying pan. When all the floating material has been skimmed, lift the tub out of the water and pour the heavy portion onto the same or separate drying pan. When the materials have dried, sort them into seeds, bones, lithics, charcoal, and other categories. Each different item is identified and quantified. This sounds very simple, but it is not. Unfortunately all of these good intentions and hard work are more than likely to produce at best inconsistent truisms if the samples are too small, not intensively or systematically collected, or culturally biased. The keys to the flotation trap are that random samples produce random results, small samples produce small results, and culturally biased samples produce meaningless results. Stratigraphy must be followed, and holistic studies are the only way to create a complete data set. Flotation is of undeniable importance in determining the qualitative nature of data present. Without it, data interpretation is severely handicapped or, even worse, misleading. Excavations at one site prior to the use of flotation recovered only a small quantity of bone. The assumption was made that the acidic soil had long since destroyed all but the large, heavy bones. Flotation showed a variety of small mammals, fish, birds, amphibians, and a much wider distribution of mussels which had only been inferred previously. Even though they may represent only a small fraction of the total bone recovered by weight, the species they represent played a role in aboriginal subsistence and must be taken into account. There is also the smaller debitage (byproducts of stone tool manufacture) which is indicative of close retouch or reworking of artifacts. Missing these data would distort the range of manufacturing and maintenance tasks undertaken. The identification of seed remains provides the necessary data for determining diet, seasonality, eco-niches exploited, reasons for the encampments, and possible techniques for food preparation and preservation. Without flotation very few seeds would ever be recovered during excavation. The discarded soil matrix as well as control samples from seemingly non-cultural zones should be analyzed as closely as the cultural samples. What seems intuitively obvious in the field when the context was positive should be quantified and described for those contexts of unknown integrity. What is not found can be as important as what is found. The recent contaminants (background noise) can yield data crucial to interpreting the occupation. One's interpretation can be biased by the nature of the flotation sampling regime. To understand what should be done, one must start by defining a meaningful cultural context, proceed with the appropriate equipment, conduct an intensive analysis of all materials found in the dried flotation samples, and interpret everything within a holistic framework. Everything present means something in relation to everything else. Flotation sampling should be thought of in the same light as soil coring. There must be a precise level by level record of the soil strata which can be examined for color, texture, nature of inclusions, and cultural materials. Many samples are taken since there is no reason to assume that the strata or contexts are identical everywhere on the site. The precise location of the sample is mapped to facilitate its correlation with other observations, artifacts, and ecofacts to aid in the analysis and interpretation of the site. Flotation is by far the most economical and efficient technique yet devised for the large scale recovery of small scale remains from archaeological deposits. At one site all the thousands of carbonized seeds, most of the identifiable bones, and a small percentage of the thousands of artifacts examined, counted, and classified were the result of flotation. Dr. Moeller has addressed some of the key issues in the floatation process. As he points out paramount to the success of this type of analysis is the need for controlled collection and floatation from every level of a site and across a broad scope. This level of analysis is time consuming and often costly, but the benefits have far outweighed the costs in terms of identifying the food sources of Native peoples. Archaeologists are enhancing this data set every time an excavation is conducted utilizing floatation. We often have written about “painting a picture of our past” this is the type of data that strengthens our analysis and interpretation. 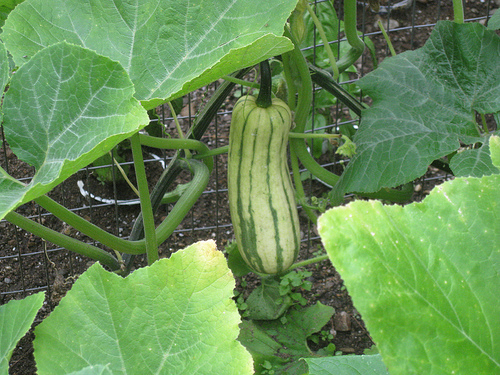 Paleoethnobotanists have identified the presence of squash much earlier in the archaeological record than previously thought. This evidence needs to be tested against other data to ensure its accuracy, but archaeologists are excited by this increased interest in floatation and the merits of research. As we sit down to our Thanksgiving meal, let’s take a moment to reflect on the role of prehistory on the development of the plants, nuts and seeds we enjoy today. Keep checking back with us over the next few weeks as we continue to develop our Farm Show exhibit on Native American foodways in Pennsylvania, and mark your calendars for the week of January 7th to visit the exhibit at thePennsylvania Farm Show Building. Our guest blogger is Dr. Bernard K. Means, of Virginia Commonwealth University. Dr. Means is a repeat "guest blogger" and we welcome his overview of new technology available for research and preservation of archaeological collections. On November 4, 2011, the Virtual Curation Unit for Recording Archaeology Materials Systematically (V.C.U.-R.A.M.S.) arrived at The State Museum of Pennsylvania to create 3D topological models of artifacts in the museum’s collections. The team consisted of myself as project director and Clinton King, our digital curator (Figure 1). Clinton is also an undergraduate student in anthropology at Virginia Commonwealth University. We had with us our NextEngine 3D object scanner. The V.C.U.-R.A.M.S. project is currently funded by the Department of Defense’s Legacy Program and was developed in cooperation with John Haynes, archaeologist for Marine Corps Base Quantico. The Legacy Program’s overall goal is to test innovative approaches and technologies to foster preservation of cultural resources on their bases across the world. Our specific task with our virtual archaeology curation project is to test the possibilities and limitations of 3D artifact scanning as a way to preserve critical cultural resources and make the digital models we create accessible to a larger audience of scholars and the interested public. We selected The State Museum of Pennsylvania as a place to test our 3D artifact scanner because we knew that the archaeology division holds a vast array of archaeological objects, some of which are over 10,000 years old. From my own experience, I also know that archaeology division personnel really know their collection well, are very open to having research conducted on these collections, and are very helpful in providing access. My thanks to Janet, Kurt, Dave, and Liz for their help with getting the materials we needed for scanning. Scanning of archaeological objects is a time-consuming process, so we selected a wide range of items to test the scanning process. We selected four items to scan: a snake skeleton still (largely) in its original soil matrix; a Monongahela pot; a Paleoindian point; and, a decorated sherd. The snake skeleton in soil matrix was recovered in 1941 from the Martin site, a Monongahela village once located in Fayette County, Pennsylvania—and now under the waters of the Youghiogheny Reservoir (Figure 2). The skeleton was recovered from above a burial. The skeleton was chosen for scanning because it represented a unique object—both bone and soil—and because it will eventually begin to break down. In fact, some vertebrae have fallen out of the soil matrix. One of the potential strengths of 3D scanning is the ability to preserve objects that are or eventually will decay. 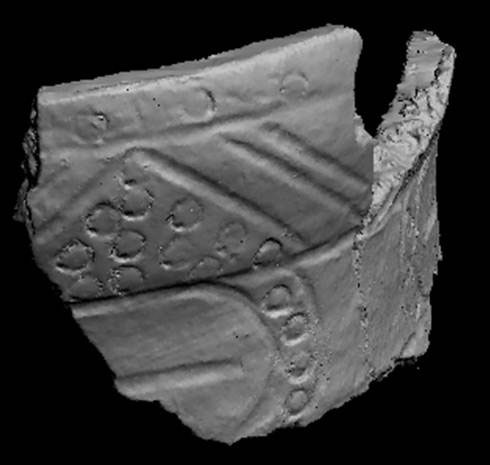 We also scanned a Monongahela pot from the Martin site which had been mended in 1941—and the mend is beginning to separate today. 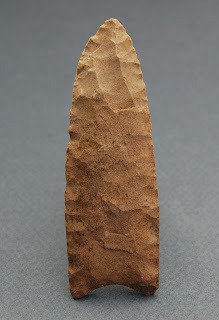 The Paleoindian point is from a site in Perry County, Pennsylvania. This point is important because it was recovered from between two radiocarbon-dated layers at the Wallis Site (36Pe16), part of the 11 & 15 Highway Project (Figure 3). Scanning of this point will allow scholars throughout the world study the object, without having to come to The State Museum to do so. With this and other objects, we can also potentially create resin models that could be used for study or educational purposes. Finally, we also scanned a sherd recovered from the Sugar Run Village site, located in Warren County, Pennsylvania (Figure 4). This sherd is associated with the Hopewell occupation of the site and was recovered by Seneca Indians in 1941, laboring as relief workers for the Civilian Conservation Corps. 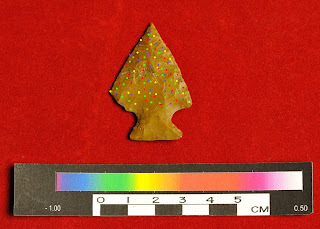 Clinton was able to process this sherd’s digital model, as well as the other three objects Friday night, and we were able to set up two laptops that allowed attendees at the Workshops in Archaeology at The State Museum on November 5 to manipulate these artifact digital models in multiple dimensions and see all facets of the objects—without having to endanger the real objects themselves (Figure 5). 3D digital scanning certainly is another great tool for making precious and fragile artifacts accessible to all citizens of Pennsylvania. We are delighted to report on the success of the return of our Workshops in Archaeology program. This past Saturday we hosted just over a hundred people from all avenues who just want to learn more about archaeology. Members of the Society for Pennsylvania Archaeology, Pennsylvania Heritage Society members, students, and the general public turned out to learn more at about the Prehistory of Pennsylvania. Presenters for the program included Pat Miller, PhD. sharing information relative to The Late Archaic/Transitional Period. During this period hunter-gatherers adapted to environmental change and increasing population density by developing new technological, social, and economic strategies. Recently there have been several major contributions from sites excavated along the Ohio River and along the Susquehanna River including the Turnpike bridge replacement project. 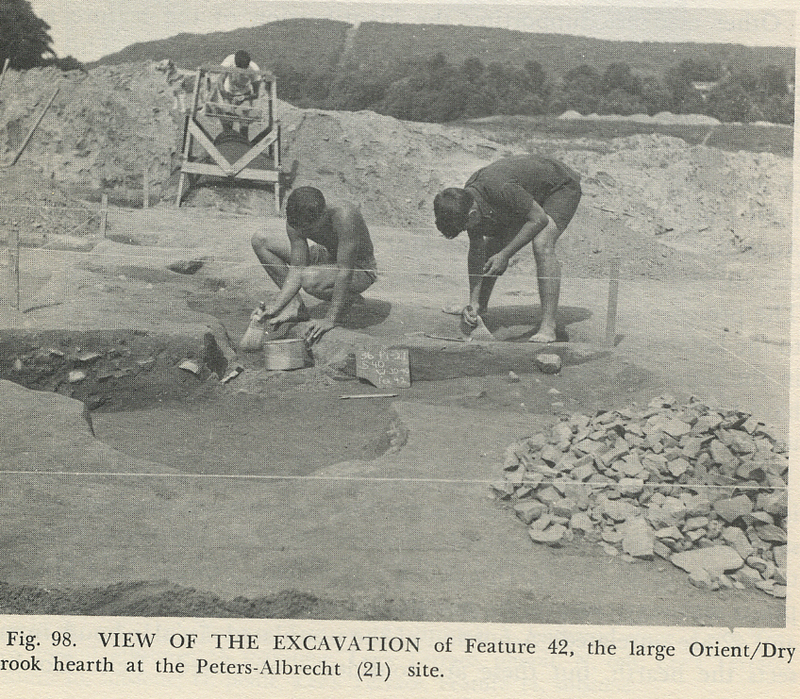 Dr. Miller was involved in these archaeological investigations and their subsequent analyses. Noel Strattan demonstrates the CRGIS program to Workshop participants. The closing comments delivered by Dr. Dean Snow, Professor of Anthropology, Penn State University were an opportunity for reflection of our understanding of past cultural behavior and the direction for archaeological research in the future. Presenters and participants engaged in discussions of the day in an informal reception held in the Hall of Anthropology and Archaeology. Dr. Dean Snow delivers the closing comments for the day. This is one of many public outreach programs that our department provides for the general populist. They are always well received and incredibly rewarding venues, but they require a lot of planning and assistance. We would be remiss in not recognizing the many contributors to the success of our program. The dedicated volunteers of The Section of Archaeology provided assistance with mailing registration forms, preparing registration packets, registering participants, organizing and furnishing the refreshments for breaks, and numerous tasks that could not be done without them. Andi, Toni, Sheila, Harmony, Melanie, Ande, Cassie and all did a terrific job! Many thanks to the following businesses Navarro & Wright, URS and TEC,Inc. for their donations which provided printing and refreshments for the Workshops. Thanks to the Pennsylvania Archaeological Council, Mark McConaughy, for his assistance in organizing the funding for this program. Staff of The State Museum provided facilities support and our wonderful security staff patiently waited for us to clear out after a long day on Saturday. We are making lists and taking notes for Archaeology Workshops 2012 and are already planning speakers and presentations for next year. If you couldn’t join us this year, please keep watch on our blog for this program in November 2012. The Archaeology Section of the State Museum of Pennsylvania invites you to attend the newly revived Annual Workshops in Archaeology tomorrow Saturday, November 5th. Designed for avocational archaeologists and the public at large, this year’s program features a review of Native American Archaeology in the Commonwealth. 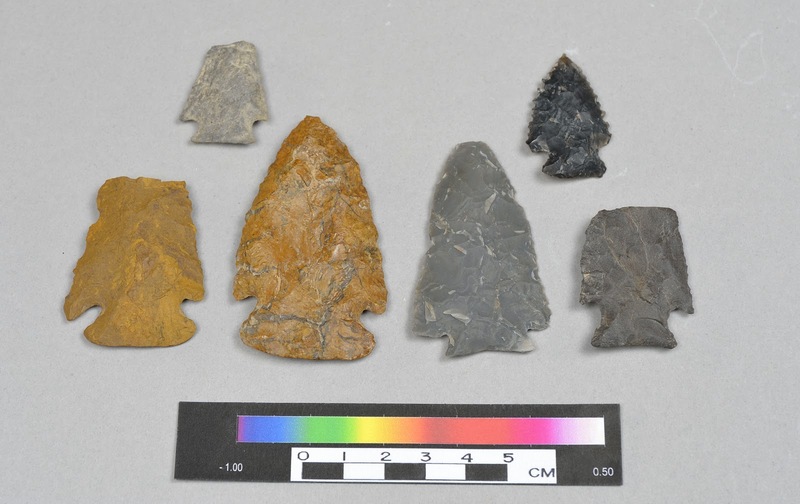 Recent excavations have contributed to the archaeological community’s understanding of Native peoples in Pennsylvania from our earliest inhabitants 16,000 years ago to European colonization during the Contact Period. Presentations will include highlights from investigations along the Susquehanna River such as the Routes 11 and 15 project around Liverpool, the Susquehanna Turnpike Bridge project, and the Leymone Susquehannock village site. There will also be a flint knapping demonstration and an artifact identification session. Closing comments by Dean Snow, PhD., professor of Anthropology, Penn State University on the value of archaeology and the contribution of archaeology to everyday life in Pennsylvania will be followed by a reception in the Anthropology and Archaeology Gallery of the State Museum. Click here for the program brochure including a detailed description of class sessions. Registration: $25.00 at the door. Archaeological Evidence of Witchcraft in PA? Just in time for Halloween, this week’s blog is going to discuss one of the more spooktacular items in our collection, a probable 18th century “witch bottle”, uncovered at Governor Printz State Park, Essington, PA by M.J. Becker in 1976. Witch bottles are ceramic or glass bottles containing a variety of ritual objects. They are created and used as protective charms to counter afflictions thought to be the product of a witch’s curse or to ward off evil spirits from a house and its inhabitants (Merrifield 1955). Belief in the supernatural and the connection between everyday human struggles and the cosmic war between God and the Devil were part of the common lexicon in England and the British Colonies in America during the 16th, 17th, and 18th centuries. Historians cite the proliferation of Church decrees, sermons, and published essays on the topic of witchcraft, the increased prevalence of legal complaints involving allegations of sorcery, and anti-witchcraft legislation as documentary proof of these commonly held beliefs (Merrifield 1955, 1987; Becker, 1980, 2005; Demos, 2008- podcast). The production and ritual deposition of Witch bottles are part of the material culture of this period. They provide evidence of popular folk beliefs and customary use of “white magic” to safeguard persons and their property from the metaphysical ill intent of others. Whether it is 17th century eastern England or 20th century Newfoundland, Canada, the general superstition associated with Witch bottles as a form of counter-curse are as follow (Merrifield, 1955; Reiti, 1997). 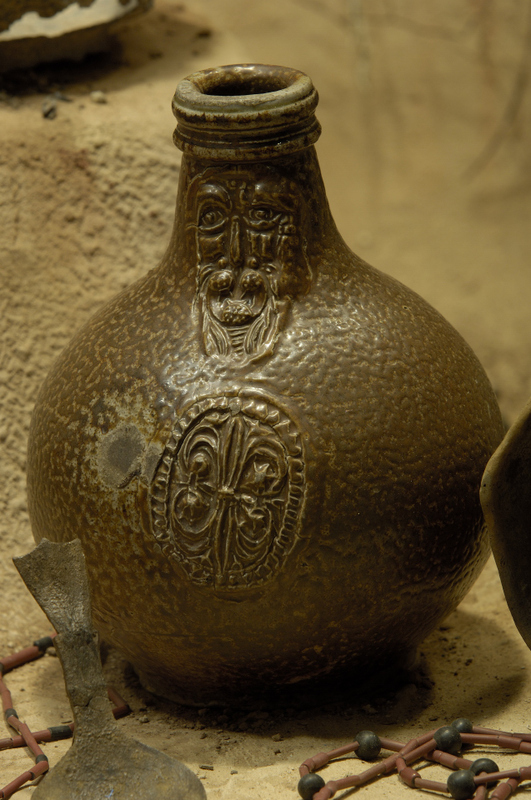 If a person believes his or her current misfortune is the result of an evil spell, the act of “bottling a witch” can serve to identify the witch and turn the curse back on the alleged attacker. Bottling a witch is a form of sympathetic magic; it was believed that the victim has somehow been tainted by a witch’s blood in the form of a curse (Merrifield, 1955). Bottles are filled with symbolic items—pins, nails, and other representational objects of the victim’s physical ailment or financial misfortune—and, in most cases, bodily fluids, typically the victim’s urine. The logic follows that the victim’s fluid also contains the blood of the witch, by trapping this in a bottle with items representing the painful symptoms of the affliction (pins, nails, etc. ), and performing ritualized actions with this bottle, the victim can redirect suffering back on the witch. After sealing and often heating the contents to a boil, the victim would choose to bury, toss the bottle into a stream, or heat the bottle until it explodes. Burying or casting the sealed bottle into a stream will give the witch a slow and painful affliction (usually some form of urinary blockage). However, this counter-affliction can be lifted if the bottle is somehow unsealed. On the other hand, exploding the bottle in a fire will create more immediate, violent and irrevocable results. Merrfield (1955) traces the first recorded documentation of the “witch bottle” to eastern England in the late 1600s. This coincides with the production and widespread export of Bellarmine jugs from Germany to London and throughout the English countryside from the mid-1500s to the early 1700s. Bellarmine bottles, decorated with the severe face of a bearded man were the apparent bottles of choice to perform “white magic” rituals of counter-curse or to create charms to ward off malicious spirits. 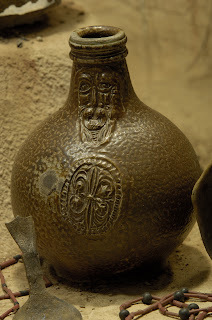 Of the 200 documented witch bottles found in England, 130 are Bellamine jugs (Merrifield, 1987). Examples of glass bottles including Pershore phials, wine flasks, such as the Essington witch bottle, and others have also been discovered. Few historical examples of witch bottles were recovered as a result of systematic archaeological investigations. However, Merrifield (1955, 1987) has compiled documented discoveries of cached witch bottles throughout England and Scotland and surmises that most bottles found in their original contexts are placed upside-down under thresholds, hearthstones, or inside walls. Merrifield contends that entrances, exits and fireplaces are vulnerable locations in a house to the spiritual world. Witch bottles placed in these contexts were more likely used for protective, rather than counter-cursing properties. Numerous witch bottles have also been recovered from secondary contexts in London along the Thames and its tributaries. 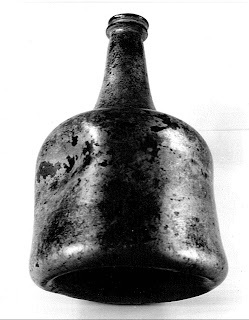 The Essington bottle, the first potential witch bottle identified from an archaeological excavation in North America, was discovered upside-down in a cache pit on Tinicum Island, just outside the foundation of a structure that Becker believes may have been the Printzhof, the home of the New Sweden Colonial Governor, Johan Printz (1643-1653). The bottle, pictured here, is a dark green squat bottle, with a date of production between 1730 and 1740 (Becker, 2005). Based on this date, Becker associates the cache with British Colonial Era in Pennsylvanian, when Tinicum Island was owned and conferred between members of the Taylor family. He conjectures that the transfer of ownership in 1748 from Israel Taylor Jr., who was bequest the land on his father’s death in 1725, to his cousin, John Taylor and his wife, may indicate that the couple, moved into the dwelling at this time. Further, that a member of their household is most likely responsible for the ritual deposit of the bottle on the premise. The bottle contains six straight pins and was sealed with a whittled wooden plug. Also found in the small pit was a redware ceramic sherd and a medium-sized bird bone. (Becker 1977, 1980, 2005). In a recent publication (2005), Becker argues for the recognition of five additional witch bottles found throughout the northeastern United States from archaeological endeavors. Finding cached witch bottles in datable contexts provides evidence of the persistence and spread of supernatural folk beliefs and customs in colonial North America and potentially into the 19th century. Perhaps even into the 21st century… So be careful who you trick this Halloween…. Or there may be a bottle with your name on it! Don't forget! Just one week to go until the Workshops in Archaeology at The State Museum of PA. Click here for program details and registration form. 1980. An American Witch Bottle. Archaeology Vol. 33:2:18-23. 2005. An update on colonial witch bottles. Pennsylvania Archaeologist. Vol. 75:2:12-23. 1955. Witch Bottles and Magical Jugs. Folklore Vol. 66:1:195-207. 1987. The Archaeology of Ritual and Magic. Batsford, London. 1997. Riddling the Witch: Violence against Women in Newfoundland Witch Tradition. In Undisciplined women: tradition and culture in Canada. Ed. Greenhill & Tye. 77-86. 2008. The Enemy within: 2,000 Years of Witch-Hunting in the Western World.